Mario!™ Link!™ Samus!™ Pikachu!™ All of your favorite Nintendo characters are back, along with plenty of new faces, in Super Smash Bros.™ for Wii U, the next entry in the beloved Super Smash Bros. series. Up to four players can battle each other locally or online across beautifully designed stages inspired by classic Nintendo home console games. With a variety of control options and amiibo compatibility, the timeless Super Smash Bros. battles come alive. 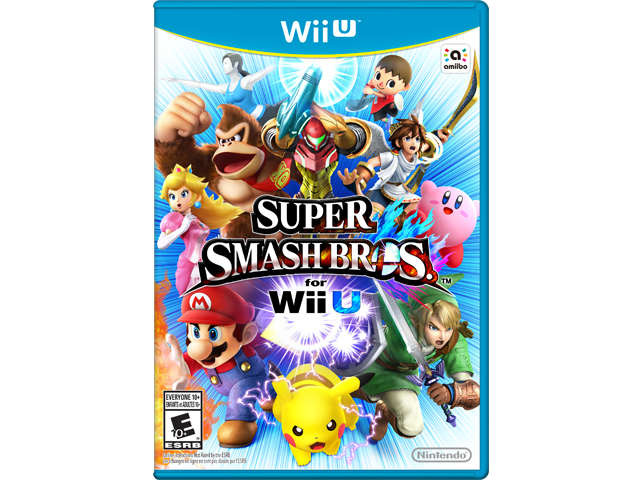 Compete with classic players from the Super Smash Bros. series, along with new challengers like Mega Man, Little Mac or newly announced Palutena, the Goddess of Light from the Kid Icarus™ games. For the first time, players can even compete as their own Mii™ characters. Use a variety of control methods during the high-energy and action-filled battles, including Nintendo GameCube™ controllers – the longtime controller of choice for hard-core Super Smash Bros. players. Customize move sets when playing locally or online with friends. Connect with amiibo for added fun. Experience the beauty of Super Smash Bros. for Wii U in stunning HD, a first for the series. Fight against friends and family locally or online, or battle random challengers from all over the world online in “For Fun” or “For Glory” modes.